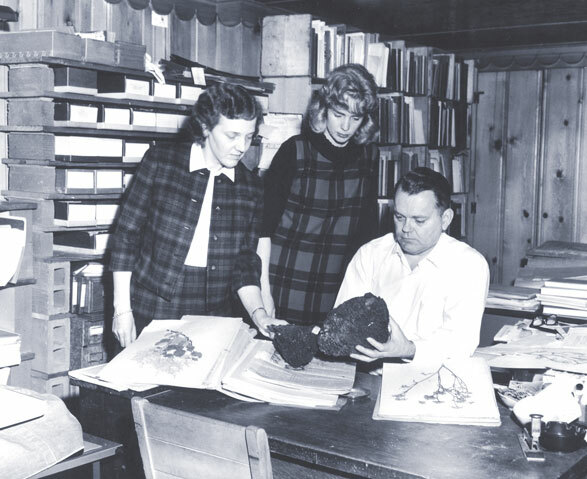 Kay French, Jane Shell Raymond ’59, and David French ’39 in 1964 Courtesy of Special Collections, Eric V. Hauser Memorial Library, Reed College. David Heath French ’39, emeritus professor of anthropology, February 12, 1994, in Portland, from a heart attack. In close conjunction with his wife, Kathrine Story French, David had long been noted for his work with the Indians living on the Warm Springs Reservation, studying all aspects of their culture, especially the languages and traditional uses of plants. David’s father, Delbert R. French ’15, and mother, Evelyn Fatland French ’15, met at Reed. Delbert contemplated a career in anthropology but decided to pursue a career in economics. Academic and other forms of employment drew the family, including David’s brother, Robert S. French ’46, from Eastern Oregon to Fresno, to Palo Alto, finally, through David's high school years, to Eugene, Oregon. As a Reed undergraduate, David’s intellectual curiosity took him in several different directions: biology, psychology, and history. One early influence was his coursework with Prof. Alexander Goldenweiser [sociology 1933–39] and Prof. Morris E. Opler [anthropology & sociology 1938–39]. At the end of David's junior year, Prof. Opler left to take a position at Claremont Graduate School, and David followed him to California, working with him to complete a BA in anthropology at Pomona with honors and an MA at Claremont Graduate School. Among his circle of acquaintances at Pomona was Kathrine (Kay) McCulloch Story, the only daughter of Russell Story, then the president of Claremont Graduate School; she graduated from Pomona in 1942 with an interdisciplinary honor's thesis in anthropology and philosophy. The two met again as graduate students in Columbia's anthropology department and married in 1943. They were colleagues, partners, and friends for life. At Columbia, David took courses with Ralph Linton and Ruth Benedict, with William Duncan Strong (archaeology), George Herzog (linguistics), and others; Ruth Bunzel, Marian W. Smith, Gene Weltfish, and others were friends as well as teachers. He never lost his love of New York: in his graduate school period, taking the subway to Greenwich Village, the Lower East Side, and Brooklyn Heights, meeting and getting to know an assortment of people—some of them “bohemians” since the ’10s—anarchists, artists, writers (including the novelist Richard Wright); there was a constant sense of being immersed in the rich variety of ethnicities, languages, dialects, lifestyles. His early research interests included American Indian mythology and Pueblo Indians. From 1943-46, David was a community analyst with the War Relocation Authority, documenting the Japanese-American community at Poston, Arizona. Graduate school was punctuated by trips to the Southwest, working at various times as junior professional assistant and junior administrative technician for the United Pueblos Agency in Albuquerque during 1941-42. David wrote his dissertation in longhand in a 24-hour coffee shop in Albuquerque. Factionalism in Isleta Pueblo involved a combination of ethnographic fieldwork and a study of historical documentation, all focused on the long-running political conflict in this pueblo community. He joined the Reed faculty in the then combined sociology and anthropology department in 1947, and two years later, he and Kay made their first exploratory trips to the Warm Springs Indian Reservation in central Oregon. He remained at Reed until his retirement in 1988—with the exception of one year spent at Columbia University and another at Harvard University as visiting faculty—having overseen the development and staffing of an independent anthropology department, and having introduced several generations of students to the field, all the while continuing to pursue a diverse set of research interests spanning several subfields of anthropology and linguistics. Just before his retirement, he helped to establish Reed's interdisciplinary linguistics program—something he'd long wished for. He was the author of many articles published in various scholarly journals. He was a member of many professional organizations; he served on the executive board, and as representative to the American Association for the Advancement of Science, for the American Anthropological Association, which gave him a Distinguished Service Award in 1988. He is survived by Kay; his brother, Robert S. French ’46; and extended family. More than 100 people gathered in commons on March 27, 1994, to honor and remember David French. President Steven Koblik [1992–2001] read a letter from Gary Snyder ’51, who regretted that he couldn't attend and wrote, “I would not be doing what I am today if I hadn't met him . . . . I was touched by his deep integrity and stubborn respect for data . . . . I came to sense a very elegant personal vision within his steadiness, though 1 was never given more than a glimpse of it.” Three people from the Warm Springs Reservation, where David worked extensively for many years, spoke eloquently about his impact on their lives. Reggie Winishut said that through his work on their language and culture, David gave the people of Warm Springs an opportunity to maintain continuity with their past and to recognize the importance of their culture. Ted Brunoe presented Kay French with a framed plaque, decorated with a beaded feather, “in recognition and appreciation of your beliefs and dedication to documenting the history and language of the Wasco people.” Jeanne Thomas, representing the Warm Springs Culture and Heritage Committee, said that David had a legacy among her people, and that "he kept us from suffering genocide and extinction.” As a representative of David 's students, Suzanne Hanchett ’62 described how he was able to encourage latent scholarly talents of very diverse individuals. Professor Bert Brehm [biology 1962–93], a close colleague of David's, called him “a master of the cultural and natural history of the Pacific Northwest, particularly the Columbia Basin,” and remembered their field trips to collect plants and their calm conversation about ethnobotany in the midst of the Columbus Day Storm of 1962. Carl Reynolds, who had been friends with David since grade school, read part of a letter he had received in summer 1935 from David, then 17 years old and looking forward to his upcoming freshman year at Reed; he also described his just-completed collaboration with David on a map-making project that involved locating 46 Wasco Indian villages along the Columbia River, a difficult task in view of the topographic and other changes wrought by construction of the Bonneville Dam. Professor Gail Kelly ’55 [anthropology 1960–2000], chair of the department, read the faculty's resolution in memory of David. Dave has always been closely associated with this period in Reed's history—a time when students and faculty often were not separated by great differences of age or outlook, and could form friendships around various avant-garde and other intellectual, political, and artistic orientations. By 1951, Dave had already become immersed in teaching, and, together with Kay, in summer fieldwork at Warm Springs. Together with colleagues like Howard Jolly [sociology 1949–70], Dave developed a style of teaching that was designed both to introduce students to the ideas and methods of social science, and to undermine certain of their cherished beliefs—beliefs, for example, that the ideas and values of their own social group, time, and place were "natural and true," rather than historically determined. For some students, this would likely entail a kind of revolution in their way of thinking, and many—between 1947 and 1988—must have experienced it as such. To do this kind of teaching successfully probably requires, in addition to great patience, some of the skills of a "trickster." Dave was unusually successful as a teacher. By the 1950s, Dave and Kay French had begun involving anthropology students in summer fieldwork at Warm Springs, many of whom—notably Dell Hymes ’50, Gail Kelly ’55, Yvonne Phillips Hajda ’55, Michael Mahar ’53, the late Ed Harper ’51, and others—went on to graduate school and decided to choose a career in anthropology. A remarkable series of Reed theses grew out of the Warm Springs work, including Robert [’53] Ornduff’s "Flora and ecology of the Warm Springs Reservation area," written for the biology department. Ornduff went on to become head of the Berkeley Herbarium and continued to collaborate with Dave on botanical projects. The 1950s were also the McCarthy Period. The Velde Committee's activities, and their impact on Reed, have been, and are still being, discussed. This was, of course, a period characterized by "loyalty oaths" and related absurdities; one such oath was concocted by an Oregon State senator, and worded in such a way that Reed College—though never named in the document—was the only educational institution in the state to which the oath could possibly apply. It seems to have involved a requirement that all professors actively and consistently show respect for the American flag in the course of their classroom activities. One day, Dave was summoned to the president's office; he was, it seems, the only (or very nearly the only) faculty member who had not yet signed the oath. When asked why this was so, Dave explained to the president's secretary that he had not signed it for two reasons: first, that the oath, as written, was ungrammatical; second, that it contained ellipses, and he felt uncomfortable about signing "oaths" that contained ellipses. Obviously, this was "applied linguistics" at its best! Finally, he signed the oath, under protest. And he did, in a fashion that we might call "classic French," comply with it: for a period of time, he simply brought an American flag to each class session, set it up in a corner, and proceeded to teach as usual. His refined appreciation for the absurd, the incongruous, and the surreal served him, and his students, through good times and bad. And it must have helped him to cultivate his friendships of many years' standing with Portland-based artists such as Louis Bunce, Michele Russo, and others, whose painterly surrealism had affinities with Dave's teacherly, tricksterly enactment of such aestheticized points of view. Dave made numerous contributions to linguistics in research and writing. In the later years of his life, he was absorbed in working on a dictionary of Wasco-Wishram Chinookan, one of the three languages spoken at Warm Springs. This is a language, and a dictionary project, that would be daunting to anyone; Dave, clearly, was daunted, but he also found the activity engrossing. Working on the dictionary was the favorite among his scholarly activities during the 1980s and into the ’90s. He was acknowledged as a master in the field of ethnobotany—the study of how plants are named, conceptualized, and used by people in society. The empirical focus, again, was the Warm Springs community, with its three tribes and languages, and the native plants of the region. His field of specialization in botanical and ethnobotanical work was the Umbelliferae, that large and diverse plant family that includes foods important alike to Europeans and Northwestern Indians—the carrot and parsnip belong to this family, as does the notoriously complex genus Lomatium, which includes many of the edible roots so important to people at Warm Springs. Dave contributed a synthetic treatment of the ethnobotany of the Umbelliferae, sketching this family's cultural significances in the broadest, worldwide terms, to a 1971 volume published by the Linnean Society of London. His other contributions to botany proper included chromosome counts (in collaboration with Lincoln Constance), studies of range extensions (with Ornduff), chemotaxonomic projects (in collaboration with Bert Brehm), and pharmacological screening (with personnel at the OSU Department of Pharmacognosy)—all, or most of it, focused on members of the genus Lomatium. In the 1960s, Mathias and Constance, botanists at the University of California–Berkeley, named a rare and recently discovered species of Lomatium after Dave: Lomatium jrenchii. Meanwhile, Dave wrote and published insightfully about the teaching of anthropology to undergraduates, about historical processes of culture change, about the relationship of anthropology to psychological studies of perception and cognition, and other subjects. In the 1990s he wrote two biographical sketches of his early teacher Alexander Goldenweiser, a memoir of Gary Snyder in the Reed milieu of the fifties, and a widely circulated piece on "misconceptions about Indians." In January of this year, just prior to his final illness, he and Kay were able to finish their sketch of the culture and society of the Wasco, Wishram, and Cascades peoples of the Columbia River, which will appear in Volume 12 of the Smithsonian Institution's Handbook of North American Indians. David was a member of numerous scientific, social-scientific, and humanistic scholarly associations, too many to list here. He served on the executive board of the American Anthropological Association (1965–68), and received in 1988 the association's distinguished service award. In June 1989, he received a certificate of appreciation from the Confederated Tribes of Warm Springs, Oregon. He wasn't particularly oriented to "prizes, honors, and awards" generally, but this last honor clearly meant a great deal to him. In the academic world of today, David French's status as an exemplar of "modernism"—his interest in language, in the use of language to talk about the natural world, his interest in surrealist, abstract-expressionist, and other art, his role in fomenting the West Coast version of the so-called "Beat Generation"—makes him historically significant. But locally, at Reed and in Oregon, we should have a fuller, richer sense of history. Before the era in which Dave and his disciplinary cronies and students lived and worked is closed off to us like the Dreamtime of the Australian Aborigines, we should think about what he, and others like him, meant, and how he was able to act so productively in so many different realms. Appeared in Reed magazine: May 1994, "News of the College"